Germany's second Earth observation satellite, TanDEM-X, was launched successfully on 21 June 2010 at 04:14 Central European Summer Time (CEST, 08:14 local time) from the Baikonur Cosmodrome in Kazakhstan. PARIS - Germany?s TanDem-X radar Earthobservation satellite was successfully launched June 21 aboard a Russian-UkrainianDnepr rocket and is expected to enter service in early 2011 alongside theTerraSAR-X satellite already in orbit to provide 3-D digital terrain models ofthe Earth?s entire landmass. 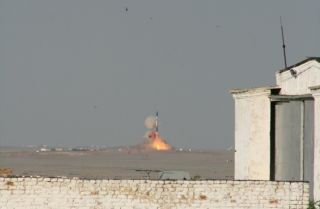 Officials from the German Aerospace Center,DLR, which webcast the launch from the Russian-run Baikonur Cosmodrome inKazakhstan, said the satellite had sent its first signals and washealthy in orbit. The 1,340-kilogram TanDem-X, like the TerraSAR-Xspacecraft launched in June 2007, is the result of a partnership betweenDLR and Astrium of Germany, whose Infoterra division has rights to sell thesatellites? imagery products. TanDem-X is about a year late in beinglaunched following delays related to the satellite?s construction and to theavailability of the Dnepr rocket. But DLR officials said TerraSAR-X, whosecontracted service life was five years in orbit, is healthy enough to operateuntil 2014, providing three years of tandem operations with TanDem-X. DLR officials expect to spend about sixmonths calibrating TanDem-X. After that, it will join TerraSAR-X in athree-year mission to map the Earth?s entire landmass with a ground resolutionof 12 meters and a vertical precision of 2 meters or better. The resulting product ? some 15 terabytes ofdata covering 150 million square kilometers of territory ? will provide whatDLR bills as the first global digital elevation model. The two X-band radar satellites are thelatest manifestations of Germany?s long interest in radarEarth observation. A German radar was placed aboard the U.S. space shuttlein 2000 as part of the Shuttle Radar Topography mission that mapped much of theEarth?s area between 60 degrees north and 60 degrees south latitude. Two datasets were produced ? one at 90-meter spatial resolution, one at 30 meters ?with a vertical precision of between 5 meters and 10 meters. TerraSAR-X was built for 185 million euros,or $226 million at current exchange rates, with DLR paying 80 percent of thecosts and Astrium financing the remaining 20 percent. TanDem-X, which uses muchof the same hardware as TerraSAR-X but is not an exact duplicate, was built for165 million euros, with DLR paying 75 percent and Astrium the rest. The figuresinclude the launch and operations. TanDem-X will operate in the same514-kilometer polar low Earth orbit as TerraSAR-X, with the two radar satellitesseparated by a distance of between 200 meters and several kilometers. The global digital elevation model data isexpected to take about three years to collect and another year to render intousable form, according to DLR. DLR will use the data for scientific and otherresearch purposes, while making the global set available to Friedrichshafen,Germany-based Infoterra. Infoterra spokeswoman Mareike Doepke saidJune 21 that because both satellites will be involved in creating the globaldigital terrain model, Infoterra will not have more conventional radar imageryavailable to it. Doepke said Infoterra, which is part of theAstrium Services company that includes Spot Image of France, which specializesin optical satellite imagery, anticipates a commercial market for the 3-Dmodels once they become available in about four years. ?The commercial potential of the TanDem-Xdata set is very promising, even if current forecasts project that onlyone-third of the data set, or about 50 million square kilometers, is of a truecommercial interest,? Doepke said in an e-mailed response to questions. ?Infoterra does not expect revenues from elevation models in remote, scarcelypopulated areas, or areas for which up-to-date elevation models are alreadyavailable from airborne campaigns. Nevertheless, from the availability of theelevation model in 2013-14, we expect a promising revenue growth potential inthe following years.? Infoterra has not determined how theelevation model data will be priced, choosing to wait to determine the level ofquality the market demands. TanDem-X?s X-band synthetic aperture radarhas three imaging modes. The ScanSAR mode has a 100-kilometer swath width and a16-meter ground resolution. In StripMap mode, the satellite takes images with a3-meter ground resolution and a 30-kilometer swath width. The highest-resolution mode, SpotLight, has a10-kilometer swath width and is capable of distinguishing objects or featuresas small as 1 meter in diameter.